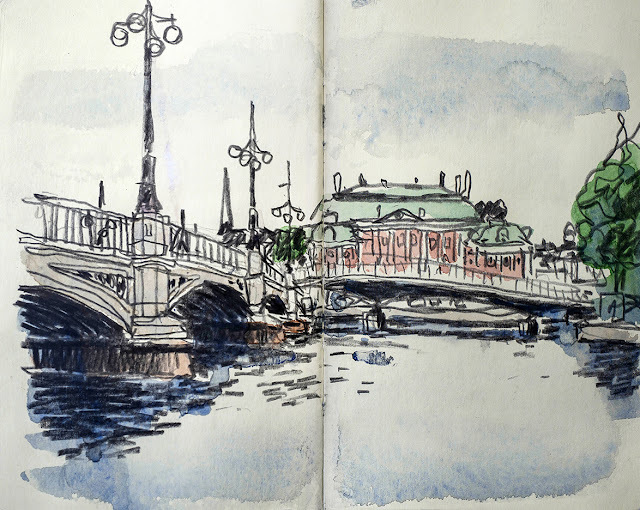 [Guest post by Paul Blazek in Stockholm] These sketches are the result of a personal challenge to fill one Moleskine sketchbook within a single weekend as part of an exercise in urban exploration. I find the small format of the Moleskine convenient to carry and well-suited to a quick and spontaneous sketch technique. 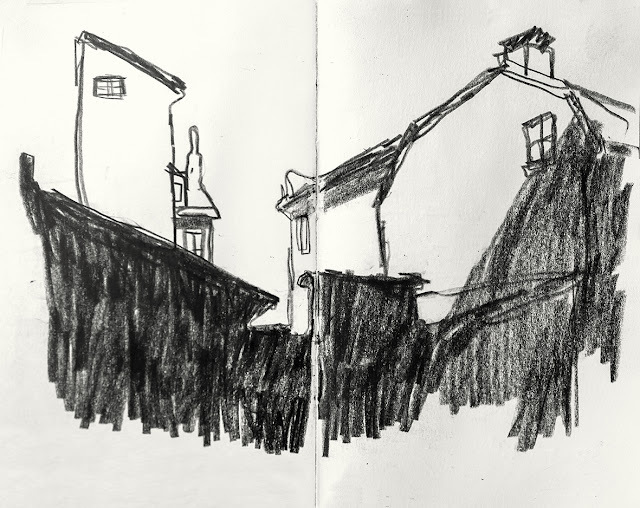 Containing 40 pages, these little sketchbooks are ideal for such an exercise. 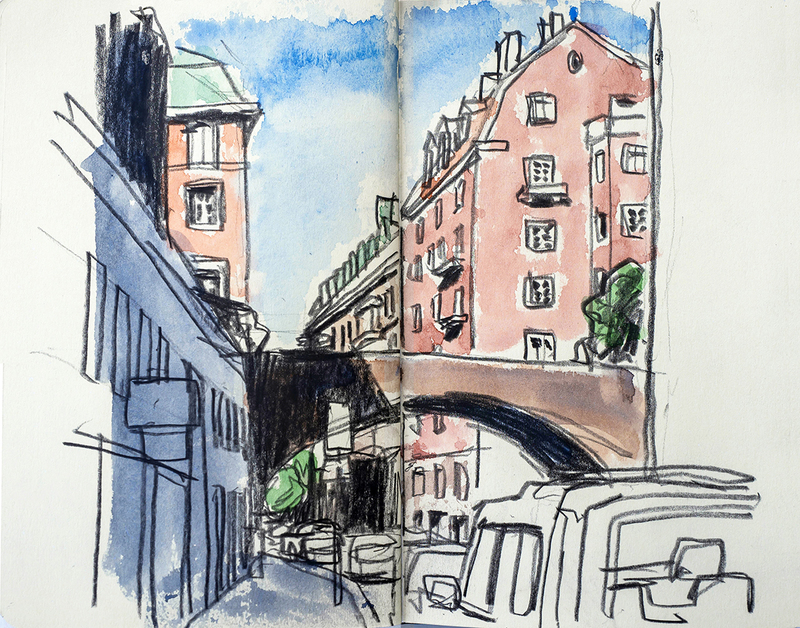 I chose a recent trip to Stockholm to take up the challenge. 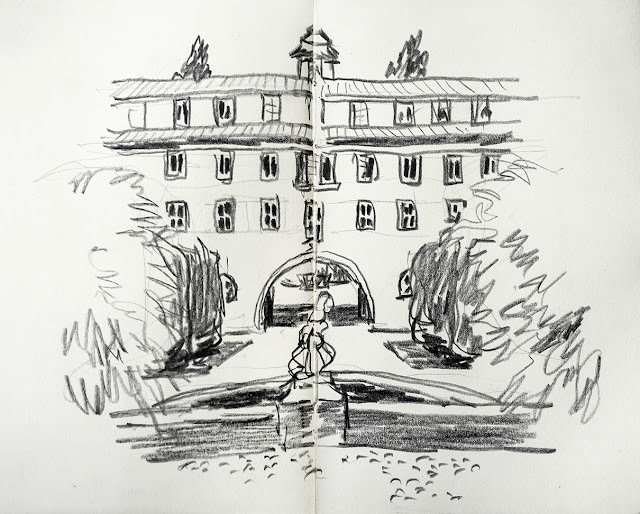 With a goal of completing 20 sketches per day for two days, the exercise honed my abilities far beyond what I was able to accomplish with the occasional drawing and left me with a renewed enthusiasm and confidence in my sketching capabilities. 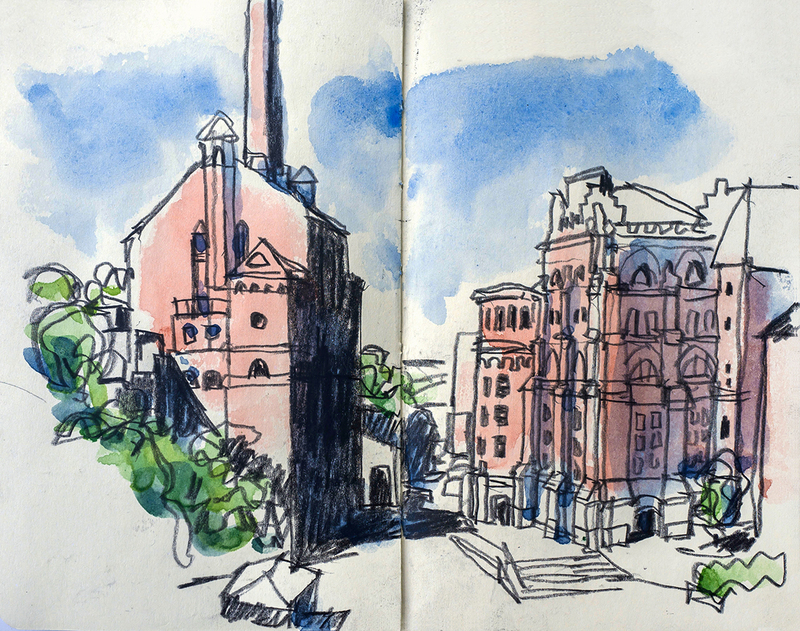 A few hours into the first day exploring the Södermalm district, I stumble on this magnificent old piece of industrial architecture, the Old Munchen Brewery (top of page). The striking brick forms in the sunlight make a compelling subject. A little ways to the east down Bastugatan Street, a cluster of old houses and their shadows create a pleasing abstract composition. On my way to the city center I am struck by the way this pedestrian stair slots through the buildings. The steep escarpment that makes up this edge of Södermalm creates many interesting urban moments. 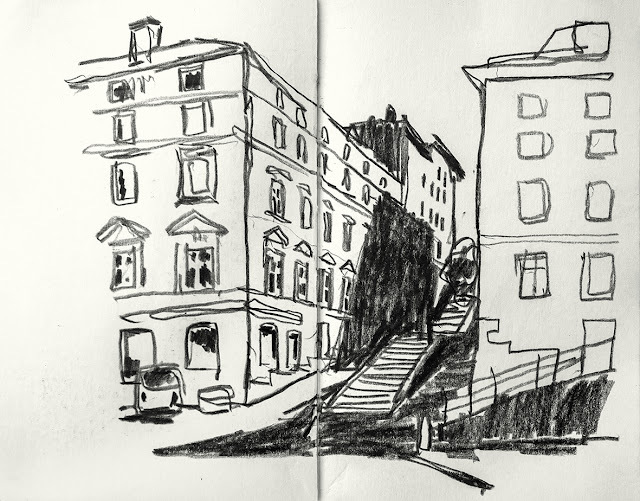 Gamla Stan, the medieval core of Stockholm, feels more Italian than Swedish. Its charming Baroque buildings and narrow streets provide charming views around every twist and turn. Here the diagonal shadow and dignified building façade made a dramatic composition. 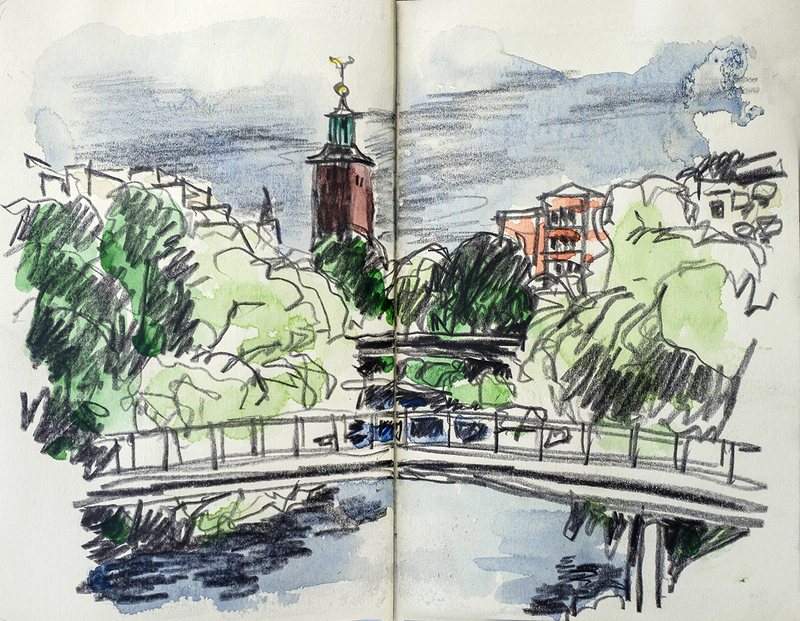 Making my way to Kungsträdgården in the early afternoon of the first day, I took on a few landscape subjects. 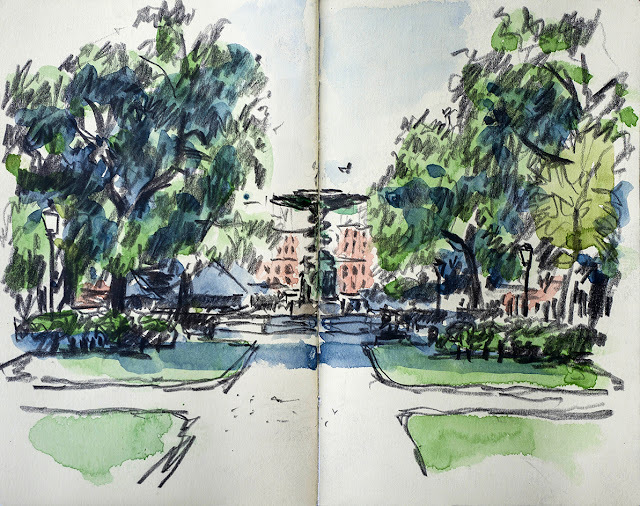 Always a fan of axial symmetry, I tried to capture a bit of the grandeur of the Molins Fountain. 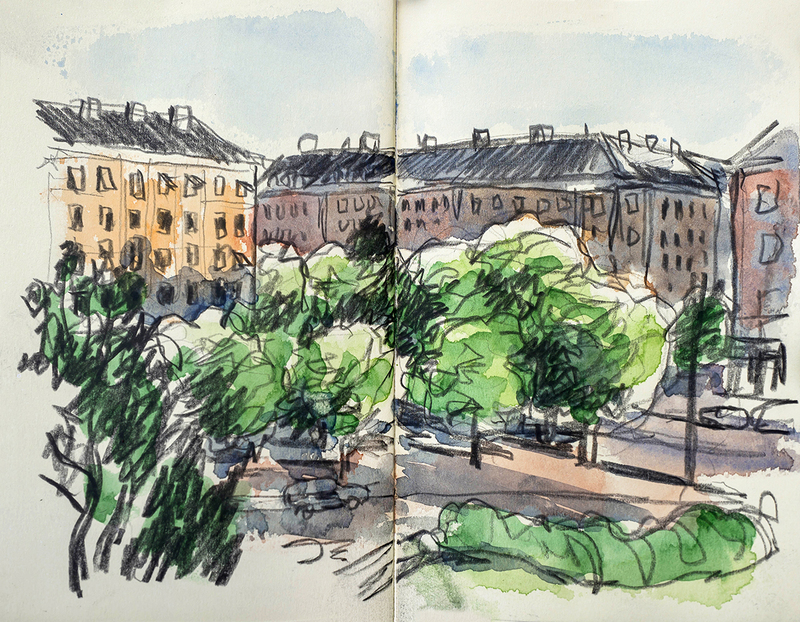 Taking advantage of the endless twilight of Stockholm’s summer evenings, I push myself to complete my first 20 sketches. 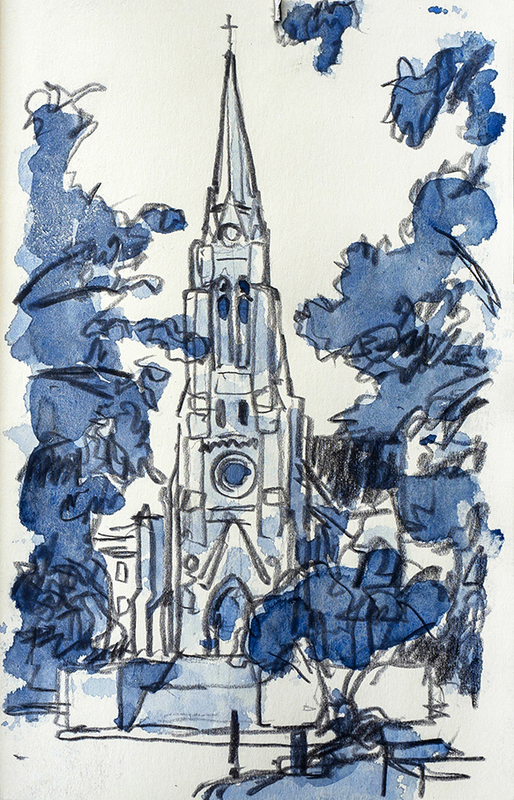 I am drawn into the peaceful grounds of St. John’s Church and take on the intimidating geometry of the church steeple, creating a composition with the surrounding trees. The beginning of day two, and I am out early in a drizzling rain trying to capture the tricky perspective vanishing of the Vasabron Bridge. 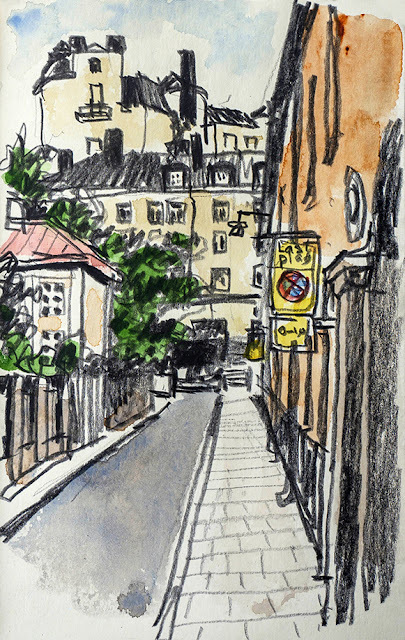 Over to Kungsholmen for more exploration, and a delightful alleyway catches my eye. The terracing architecture and distinctive black roofs give Stockholm its unique identity. On my way back to the city center crossing the Klara Sjö canal, I spy this great view of the Stockholm City Hall bell tower framed by trees. 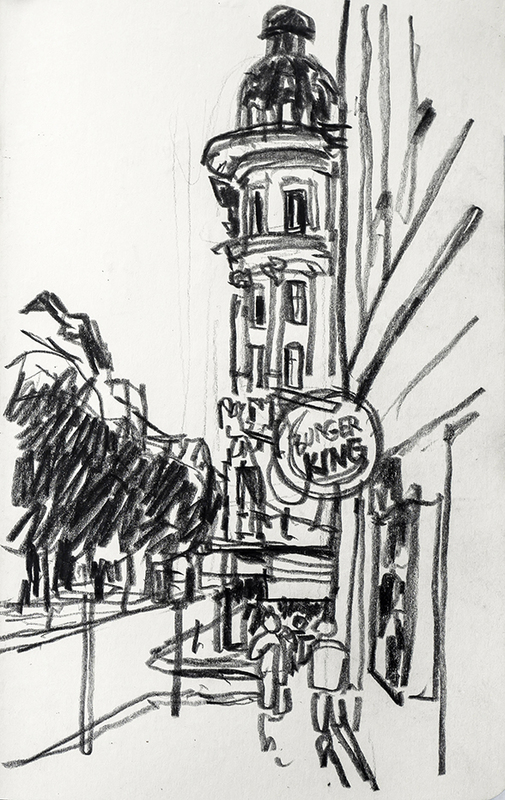 Trying to capture some everyday street scenes, this cantilevered turret, street trees and Burger King sign make a pleasing urban composition. 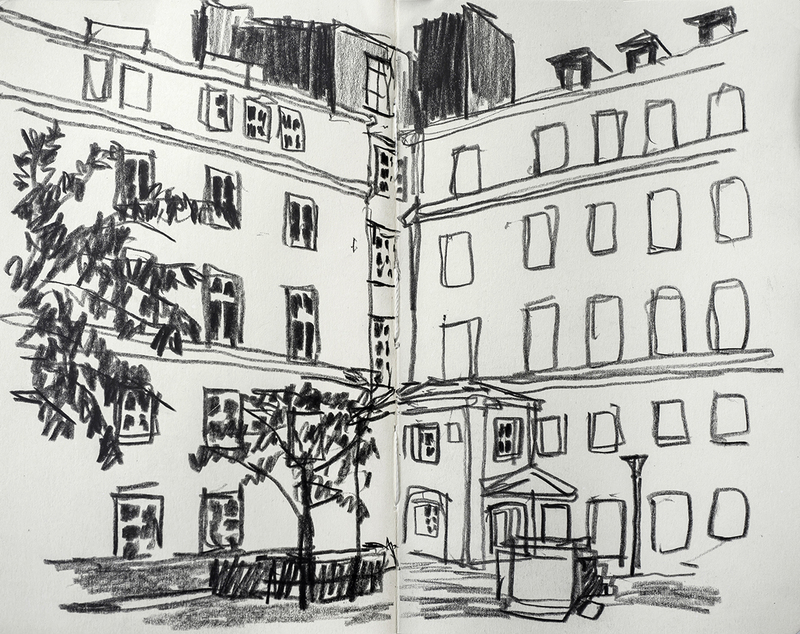 Desperate for more subjects to sketch, I peek into this residential courtyard. Taking advantage of a bench on the premises I rest my feet while I try to work out the perspective angles. 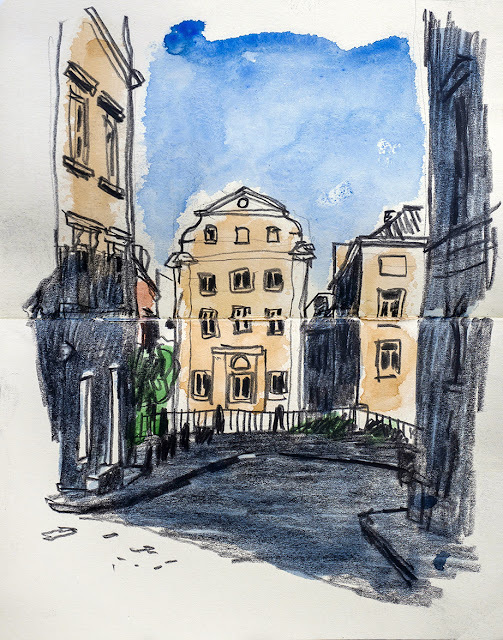 I was struck by the layered nature of many Stockholm neighborhoods. I loved the way the streets cross over each other and the buildings sort of fill in the gaps. It makes for surprising and delightful urban moments. One of so many charming streetscapes in Vasastan. 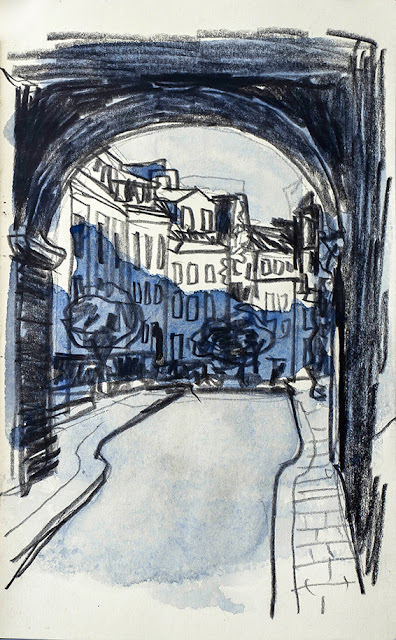 I loved the way this winding street was framed by the arched portal. The Stockholm Royal Institute of Technology, a delightful neoclassical campus by Erik Lallerstedt. 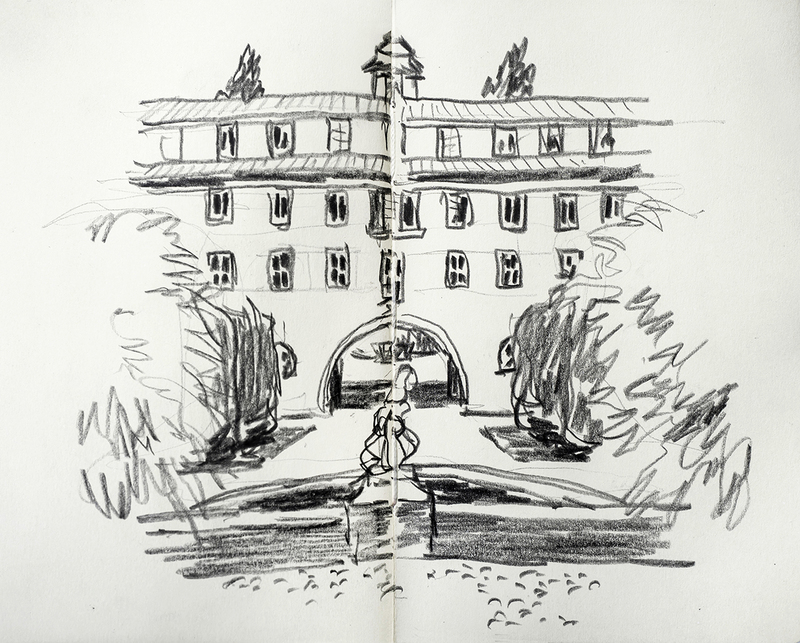 I was taken by the pure forms and powerful central axis as the campus ascends the hillside. Racing to catch the light before the sun finally set, I try to capture the long shadows and yellow glow of the midnight sun on the facades of Karlavägen Street. Paul Blazek is a landscape architect and amateur artist from Cleveland, Ohio, in the United States. He has lived and worked abroad for the last 15 years. See more of his work on his website.